Plastic solar cells are light, easy to install, and readily produced using a printer. Nevertheless, the processes that take place on the molecular scale during the production of organic solar cells are not yet entirely clear. Researchers from the Technical University of Munich (TUM) have now managed to observe these processes in real time. Their findings, which are published in the specialist journal Advanced Energy Materials, could help to improve the efficiency of organic solar cells. The solar modules that can be seen on the roofs of many houses mainly consist of the semiconductor silicon. They are heavy and consequently costly to secure on roofs. Moreover, they do not blend in very well with their surroundings. Organic solar cells, which consist of organic molecules like plastic bags or cling film, are an alternative to these conventional solar cells. Organic solar cells are soluble and can therefore be produced using a printer. Since they are very thin and light weight the installation of this thin light converting device in a variety of different locations is feasible, furthermore, the color and shape of the solar cells can also be adjusted. One of the current disadvantages is, however: The efficiency of organic photovoltaics has not yet reached that of silicon solar cells. One of the key parameters for harvesting more energy from the flexible solar cells is the arrangement of the molecular components of the material. This is important for the energy conversion because, as in the case of the "classic" solar cell, free electrons must be produced. To do this, organic solar cells need two types of material, one that donates electrons and another one that accepts them. The interface between these materials must be as large as possible to convert light into electricity. Up to now, it was not known exactly how the molecules align with each other during the printing process and how the crystals they form grow during the drying process. Like the pigments in printer ink, the molecules are initially contained in a solution. 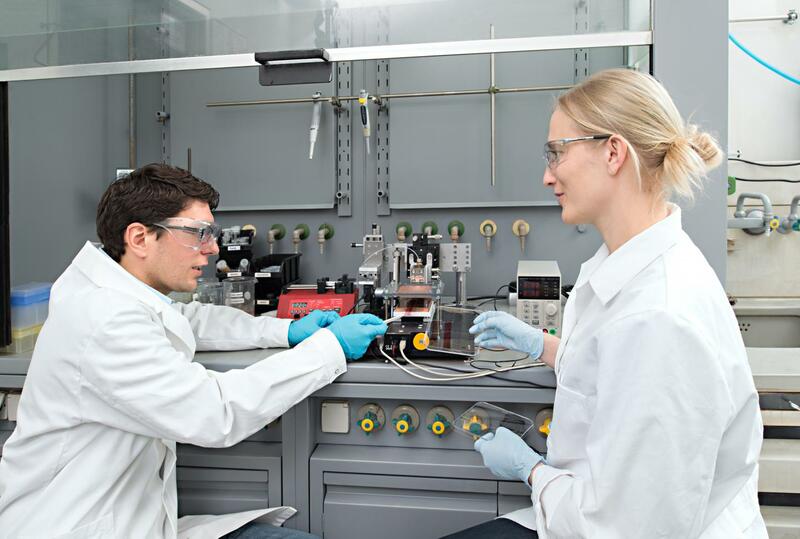 "In order to be able to control the arrangement of the components, we need to understand what happens at the molecular level during the drying process," explains Dr. Eva M. Herzig from the Munich School of Engineering (MSE) at TUM. To resolve such small structures inside a drying film with adequate time resolution presents an experimental challenge. Working in cooperation with the Lawrence Berkeley National Laboratory in the USA, Stephan Pröller, doctoral candidate at MSE, used X-rays to make the molecules and their processes visible during the printing of a plastic film. He identified different phases that unfold during the drying of the film. Initially the solvent evaporates while the other materials stay in solution. This leads to an increase in the concentration of the plastic molecules in the wet film until the electron donor starts crystallizing. At the same time the electron acceptor starts to form aggregates. A fast crystallization process follows, pushing the aggregates of the electron acceptor closer together. At this stage the distance between the interfaces of the two materials is defined, which is closely related to efficiency. To systematically improve the solar cells, this step in the printing process needs to be controlled. In the last stage optimizing processes within the individual materials are taking place, like the optimization of the packing of the crystals. "The production speed also plays an important role," explains Pröller. Although this pattern is preserved with faster drying processes, the aggregates and crystals formed by the materials influence the remainder of the structure formation so that slower structure formation has a more positive impact on the final efficiency. The researchers would now like to use their insights into the processes to gain specific control over the arrangement of the materials using other parameters. These results could then be transferred to industrial production and help to optimize it. Publication: Organic Solar Cells: Following the Morphology Formation In Situ in Printed Active Layers for Organic Solar Cells, Pröller et al., Advanced Energy Materials, Volume 6, Issue 1, January 2016.